This easy pinwheel quilt pattern uses 2 charm packs for a twin size quilt and one to make a pinwheel baby quilt pattern. Beginners make it today! What I like most about this pattern is that it's so colorful! It uses eight different colors of fabric that have dots. A teen will love the colors for sure! At an approximate size of 60 x 75 inches this quilt is small enough to be a lap quilt and should just fit a twin size bed with no overhang. Easy and great for snuggling under while watching TV or playing video games! 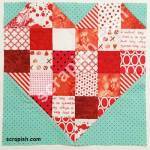 There are 42 squares in one charm pack, which is enough to make 20 pinwheel blocks. For a twin size quilt you'll need 2 charm packs. You'll need some background fabric too. All seams are 1/4 inch unless otherwise noted. 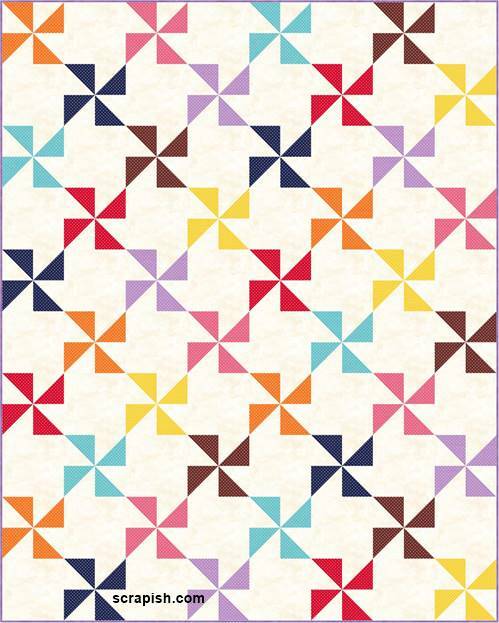 For this pinwheel quilt pattern you'll need to make 40 pinwheel blocks. Take a look at the charm pack I pulled from my stash. The squares are different shades of several color families - blue, brown, green, purple, cream, red, etc. Group the squares by color. Later (Step 3), I'll simply pair like and similar colored HSTs together. The result will be some scrappy pinwheels. Step 2b Make HSTs Pair one Fabric A (5 inch) square with one Fabric B (5 inch) square to make 160 half square triangles (HSTs). 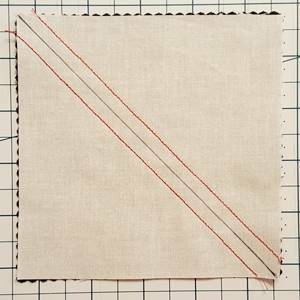 Use a pen or pencil and draw a diagonal line from corner to corner on the wrong side of all the Fabric B squares. Place Fabric A squares right side up and place Fabric B squares right side down on top of Fabric A squares. Stitch a 1/4 inch seam away from both sides of the marked line for all of the pairs. 2c Use a rotary cutter and cut the square apart on the marked diagonal line for all of the pairs. Press seams toward Fabric A. Decide which shades of each color grouping to put in one block. For example, here my HSTs are in 5 shades of green. Layout 4 HSTs 2 by 2 for each block to make 40 pinwheel blocks. Refer to the pinwheel quilt block tutorial to see step by step pictures of how to make the block. For each block (refer to one of the pictures above), place Unit 2 (Row 1, Col 2) face down over Unit 1 (Row 1, Col 1) (the left edge of Unit 2 should be aligned with the right edge of Unit 1). Sew a 1/4 inch seam down the right side to join the squares. Press seams in opposite directions so that they will nest when you stitch the rows together. Next, fold Row 2, right side down, onto Row 1 (the top edge of Row 1 should be aligned with the bottom edge of Row 1). Sew a 1/4 inch seam to join the rows. Step 3d Repeat Steps 3b and 3c for all pinwheel blocks. Step 3e Trim Blocks Trim/Square Up the blocks to size. In this pinwheel quilt pattern that's 8 inches square unfinished. If your blocks are not 8 inches square, simply trim them all to the same size. If you have to trim them smaller than 8 inches, that's okay. Just trim them all the same size. Step 4 Cut Plain Squares From Fabric B (mottled cream) cut 8 (8 inch x WOF) strips; subcut 5 (8 inch) squares from each for a total of 40. 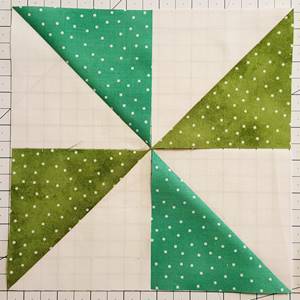 Note: If you had to trim your pinwheel blocks smaller that 8 inches square, cut your WOF strips and subcut your squares to that width. 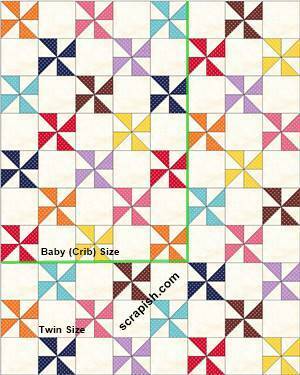 Refer to the twin size pinwheel quilt pattern quilt assembly diagram for the next step. Step 5 Layout the pinwheel blocks and plain squares as shown in quilt assembly diagram. 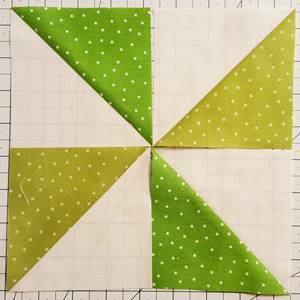 Be sure to layout your pinwheel blocks in a color order that is pleasing to you. Step 6 Sew Blocks To One Another Sew the blocks of each row together. Press the seams of each row in opposite directions. Step 7 Sew Rows Together Sew the rows to one another starting with stitching Row 2 to Row 1. Sew Row 3 to Row 2, Row 4 to Row 3, and all other rows in the same manner. Cut the backing fabric in half crosswise (from selvage to selvage). 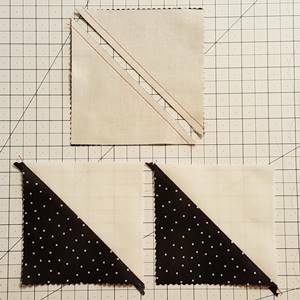 Put the pinwheel quilt pattern quilt sandwich together by layering in this order: backing, batting and quilt top. Pin baste the three layers together. Now quilt the three layers. May I suggest a straight line quilting pattern of diagonal lines, first going from left to right and then going from right to left of the quilt. Make the grid lines about 2 inches apart. Or, if you know how to free-motion quilt go for it! From 3/4 yards of fabric cut 7 (2 1/2 inch x WOF strips) strips and join to make a single long binding strip. 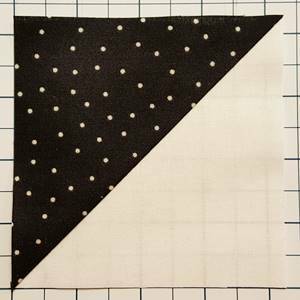 To make a pinwheel baby quilt from this pattern, just make 72 half square triangles for 18 pinwheel blocks and cut 17 plain blocks. 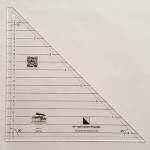 Approximate size will be 37 1/2 x 52 1/2 inches. The layout is 5 x 7 blocks (see quilt assembly diagram above). As a reminder the American Academy of Pediatrics recommends that you "keep pillows, quilts, comforters, sheepskins, and stuffed toys out of your baby's crib." 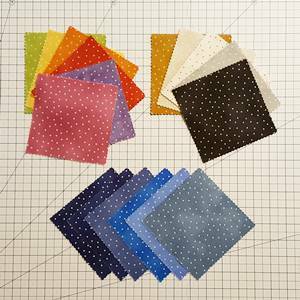 Here are the fabric and cutting requirements for the pinwheel baby quilt pattern. Then, follow the pattern instructions above. 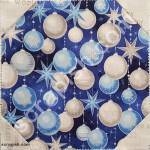 Backing: This baby quilt is small enough so that you can use yardage for the backing without having to piece it. Easy! Binding: From 1/2 yard of fabric cut 5 (2 1/2 inch x WOF strips) strips and join to make a single long binding strip. 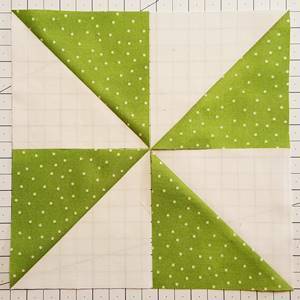 The pinwheel quilt pattern is easy for beginners to make using an alternate plain square block. Why? Because it gives you a break from matching too many seams like you would need to do if all of the blocks were pinwheels. Clever, huh? :-) Enjoy making it!